The Dyson V6 Absolute Cord-free Vacuum stretches cleaning boundaries with its new lightweight, hassle-free design. This cordless﻿ vacuum cleaner has collected a ton of positive reviews for both its stick and handheld forms and has been featured in our list of best dyson vacuums of 2019. At only 5.07 lbs., it comes with a variety of lightweight attachments that can be used whenever and wherever the need arises. The Dyson V6 Absolute Cord-free Vacuum has been receiving positive reviews from buyers everywhere. Equipped with a Dyson digital motor and a washable HEPA filter, this Dyson vacuum cleaner is a revolutionary find. It’s perfect for hardwood floors, thick carpets, ceiling dusting, and even car maintenance. With its lightweight design and rechargeable battery, the Dyson V6 vacuum can be taken anywhere around your house, car, or business. What’s even better is that it features an easy-to-handle one-touch bin emptying system. This allows for quick dust and debris clearing without having to get your hands dirty. The Dyson V6 cordless vacuum cleaner features both a soft roller cleaner head and a thick bristle head. One is great on hardwood floors, while the other is great for bushy carpets. Pair this with their 2 tier radial cyclones and two suction options, this vacuum cleaner is truly an all-in-one package. The Dyson V6 Absolute Cord-free Vacuum holds nothing back with its assortment of features, accessories, and attachments. Most notable is the washable HEPA filter. It’s great for those suffering from asthma or allergies and looking to buy a Dyson vacuum. High-Efficiency Particulate Arresting (HEPA) filters are commonly used in medical facilities, hospitals, and aircrafts. Now it’ll be used in your house or business. To be considered a U.S. certified HEPA filter, the system must be able to collect 99.7 percent of dust particles in the air. Each particle should at least have a size of 0.3 micrometers. That’s pretty impressive. The Dyson V6 absolute vacuum cleaner has the ability to clear your home of all dust leaving it breathable and fresh. The Dyson vacuum comes with a rechargeable battery and handy charging stand that can be stored anywhere around the house. Charging hours can last up to 3.5 hours. The stand also includes an LED blue light that shines when the vacuum cleaner is successfully charging. Unfortunately, the light does not indicate when the vacuum cleaner is fully charged or how much life is left. 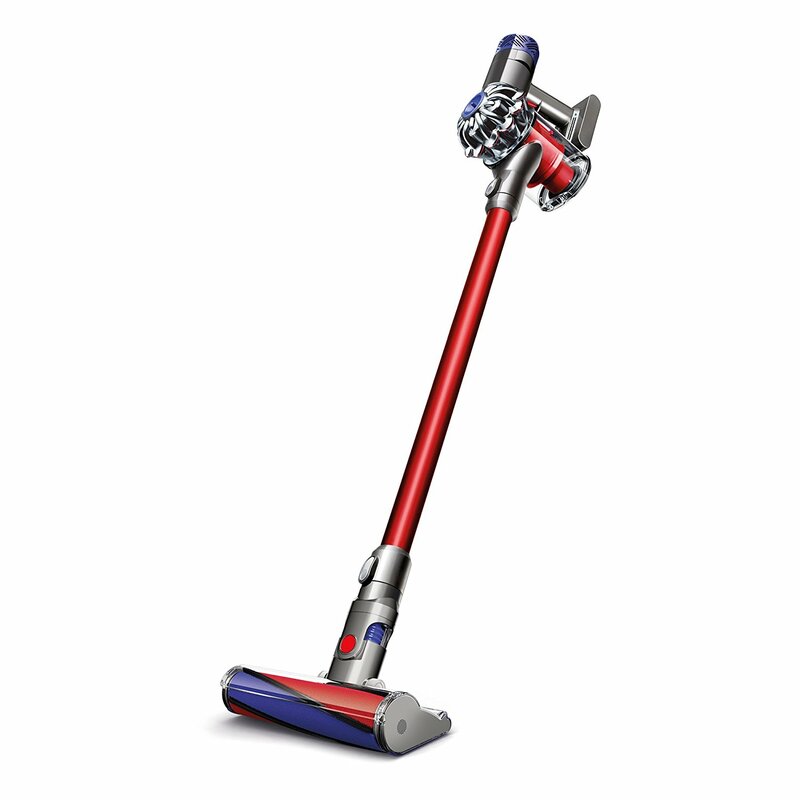 Dyson’s V6 Absolute cord-free vacuum has two forms: stick and handheld. The stick is great for reaching high corners in the ceiling and tight spaces between and under furniture. The handheld is perfect for small messes, upholstery, stairs, and car maintenance. To convert from stick to handheld, simply remove the wand and fasten on any wanted attachments to the base. The direct-drive cleaner head is an attachable head that can be fastened to the base of the wand. With thick, long bristles, it can reach deeper into any carpet compared to other Dyson vacuum cleaners. Paired with the impressive suction power, it can pick up excess dirt and debris around your house and furniture. The soft roller cleaner head was designed and built for hardwood floors. With its thick cotton rollers, it can pick up dirt and dust on both the ceiling and floor. The Dyson V6 vacuum cleaner has two suction speeds: low and max. Low speed is meant for quick cleaning and picking up dirt around the house. Max speed is great for large debris and frustrating messes that require super-powered suction. Unfortunately, at max speed, the rechargeable battery lasts for a total of six minutes. Therefore, it’s recommended to use the low speed option for the majority of the time. The attachable mini motorized tool contains dozens of stiff nylon bristles for frustrating pet hair. It can be used on furniture and upholstery or in the car for easy cleanup. Check also our ﻿﻿﻿comparison reviews of Dyson V6 vs Dyson V8. Dyson offers a two (2) year warranty for their Dyson V6 Absolute vacuum cleaner. It's the same year warranty for the Dyson V8 Absolute. To be eligible for a refund or replacement, you must first register as a Dyson Machine Owner. Dyson V6 cordless vacuum cleaner is warranted for up to two years against defects in materials or workmanship. Damages caused by wear and tear, misuse, abuse, weather, and/or lack of maintenance aren’t covered in the warranty. Also, be sure to keep a receipt when you buy a Dyson vacuum or an upright vacuum incase extra information is needed. How To Fix Dyson V6 Motorhead Brush Bar ? Make no mistake, the Dyson V6 Absolute Cord-free vacuum cleaner is a high-end product with a sleek, high-tech design. Even with the two year warranty, there’s no guarantee that it won’t break down due to wear and tear or simple carelessness. That’s why I wouldn’t suggest purchasing a Dyson V6 absolute unless you have the extra money or need it for business related maintenance. If you are looking for old model of dyson vacum,the Dyson DC41 (animal bagless), Dyson DC65 (animal complete) or the Dyson DC65 (multi floor) can help. If you do decide to buy a Dyson V6 vacuum cleaner, please feel free to review and comment about your experience. What did you use the Dyson cordless vacuum cleaner for? Would you recommend purchasing a Dyson V6 Absolute Cord-free vacuum to your friends?